Chaos Elemental is an elemental boss found within the deep wilderness. 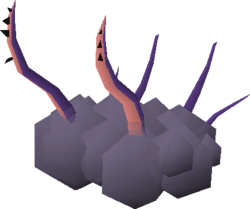 Chaos Elemental is often described as the most annoying boss in Old School Runescape. It does not have a particularly good drop table and as it is found in very deep wilderness, it is likely you will run into PKers. Combine that with the fact that the Chaos Elemental has some very annoying attacks like it’s Disarm attack, which will randomly unequip armour and weapons – it’s safe to say the Chaos Elemental is probably one of the least farmed bosses in the game. The most common tactic to use at Chaos Elemental is full Veracs as Chaos Elemental has extremely high melee defences. The Verac’s set effect gives you a 25% chance of ignoring this high defence – combine this with the fact that you can protect the full set by utilising the Protect Item prayer, and Veracs makes a perfect armour choice for this boss. The Chaos Elemental fight is a fairly simple one. It’s primary attack can deal either melee, magic or ranged damage and it’s impossible to predict – but it does hit with it’s Magic attack more frequently so you should use the Protection from Magic prayer. Watch out for it’s Teleport attack and it’s Disarm attack – which are more annoying than they are threatening – however they can distract you from the real threat at the Chaos Elemental which is PKers. Keep your health high and stay on the lookout.